You know why Unity didn't steal the vote? BECAUSE THEY DIDN'T HAVE TO. 14 color cards for 9 bargaining units - why? beats me. The emails started coming yesterday afternoon. Skeptics about the vote being real. People looking for chinks to challenge the outcome. Can the AAA be trusted? (Yes - they could go to jail if not). I spent good chunks of the past 2 days watching the AAA process -- mostly temp workers from Philly and other places brought in to do the work of opening school packages, matching names to ballots (verification), opening up the outer envelopes and pulling the inner envelopes. 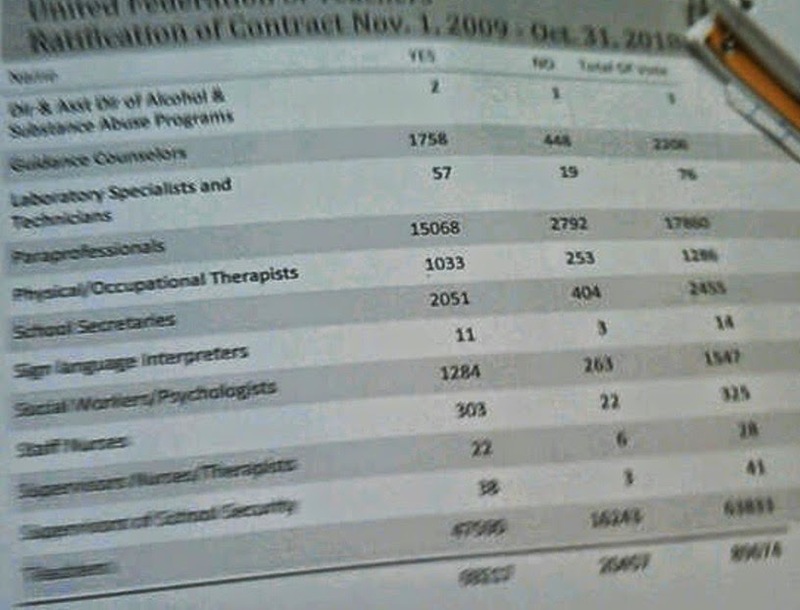 NOTE- THESE TOTALS WERE PRELIMINARY, NOT FINAL - don't you love that 3 person chapter where it was 2 YES and 1 NO? Where is that Unity slug who challenged me yesterday when I suggested school totals be published? Every batch I watched - say 1-200 hundred cards - had an overwhelming amount of YES - I was just watching the white teacher cards, not the 14 other colors. After a while I didn't even bother, the outcome was so clear even 15 minutes after I arrived at noon. Ellen Fox was there and said she saw 70-30. In my brief forays - where I counted YESes on one hand and NOs on the other, I was seeing 80-20 or 75-25. I think only one batch we watched looked 50-50ish. I never say a batch that had overwhelming NOs - which given that many of them were bunched from the same school, we might have seen. I keep telling them Unity did not steal this election by cheating at the Unity dominated school level where rogue chapter leaders could substitute sure bet NO votes for yes votes. But people kept coming up with theories. Steam open the signed outer envelopes of sure NOs and substitute a NO ballot inside. Or just toss the NO person and make up a dupe and forge the signature on a new one. And those 30 missing sheets I reported on after Monday? (UFT Contract: A Day At the Count - What I Learned). They were down to 2 as the others were found in 2nd or 3rd packages. vote which was overwhelmingly YES. 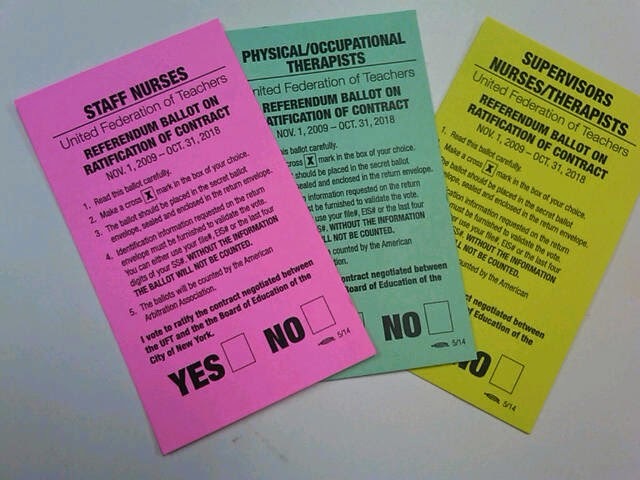 All 3 are bunched together - about 500 are nurses who probably vote almost unanimously YES and 1200 OT/PT who apparently also voted mostly yes though it you break that out it might be closer -- the UFT has those break-out figures but I didn't get them. The only issue I had was why it seemed 200 or 300 schools didn't send in ballots. I waited as late as I could to get that number but finally gave up around 7:30. A union official informed me that ballots were sent to 1650 schools. Why when there are supposed to be 1850? I also would want to know which schools did not send in ballots. I bet we would have to go to court to get that info. But I feel people are entitled to know if their school didn't get to vote. I had long and intensive conversations with UFT Chief Financial Officer David Hickey and the UFT Membership head (sorry I forgot her name) about the process they used. They were open and answered every question in depth. They sent out ballots to I think 8000 homes using the last address they had. I went away understanding the process and the issues they faced in executing this vote. I had no problems. If it is ever close, would there be some cheating at the school level or above? Hell yes - Given that the mantra is to keep control of the union and their jobs. BUT - You know why they didn't cheat? UFT officials seemed genuinely happy at the turnout - and I think they were very embarrassed at the low 2013 union election turnout - even though winning, they looked sick when the saw the outcomes then. I think there will be serious thought about doing something different in the 2016 elections. Hickey seemed very up for that - and was talking about it with New Action's Mike Shulman. All the people involved in elections would have to be part of these discussions. The conspiracy theorists would be going wild and my solution of publishing outcomes in every school with over x members -- say 10 so it is a secret ballot --- that would be a serious check on cheating --- by either side - do I know a few anti-unity people I've met over the years with such hatred they would do anything? Hell yes. And you know who you are. 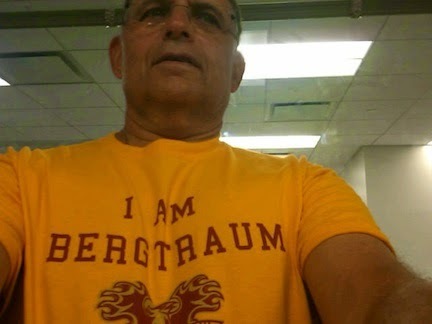 I'll close with the selfie I took with my ancient Blackberry - I wore the shirt on honor of the school which was killed under Bloomberg and is not being helped under Farina -and its great chapter leader John Elfrank-Dana. Norm, you hold it all together for us. Yes, I know who I am. I am one of those. I have seen Unity and I know how they operate. I know how they do diddley squat for members in need, for what they have allowed teaching to become in NYC, for the lies and the gift baskets, along with the double salaries, pensions, blackberrys, and other perks. Thank you, Norm, for doing all that you do for us, for the rank and file, even if they don't know it, and for, hopefully, the future of unionism and democracy, as we once knew it. In my experience, many of the teachers young and old are truly idiotic, simpleton sheep. As long as nothing impacts their little world, they won't inform or educate themselves on anything whatsoever. I guess they didn't think they were worthy of retroactive until 5 years from now. Maybe they suffer from abused spouse syndrome. Happy for any crumbs they get. 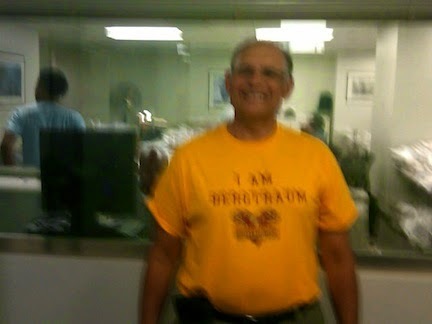 First; I want a shirt like that. Second, I agree about Unity winning and not stealing a vote. What I don't agree with is the premise that this was a vote that can so quickly compared to something like an oppositional election. This was a vote made by our colleagues -educated men and women who do the admirable job of teaching. They voted in accordance with their own self-interests. No one voted for MORE or for NA. They voted for things like their rent, their student loans and families.. you know, things like that. These aren't sheep and they're not customers walking around a car dealership waiting to be convinced. They have Bachelor's Degrees and Masters degrees and they'll make up their own mind, thank you very much. All any responsible group of unionists could have done was to share the information, including the many 'what ifs', and make connections with their colleagues. Although we could have made more connections with our colleagues, the simple fact is that a 'Yes' vote is not a loss for MORE anymore than a 'NO' vote would have been a win for MORE. In fact, that so many people voted is a win for our union. I think, given the organizing that they are obviously doing on the school level since last year, that MORE has made inroads into OUR union's leadership that haven't been made in a long long time. Organizing is one. Acknowledging, in this contract, the many 3020a results seems to be another (clearly their new social media presence is a third). That VP Barr took that picture of you is all the proof needed to show that they are learning how to play well with another group who will have no part of their philosophies, yet love our union as much as they do. That growth by itself speaks volumes. The outcome of all this only enforces the notion that bachelors and masters degrees by no means improve intelligence or judgment.